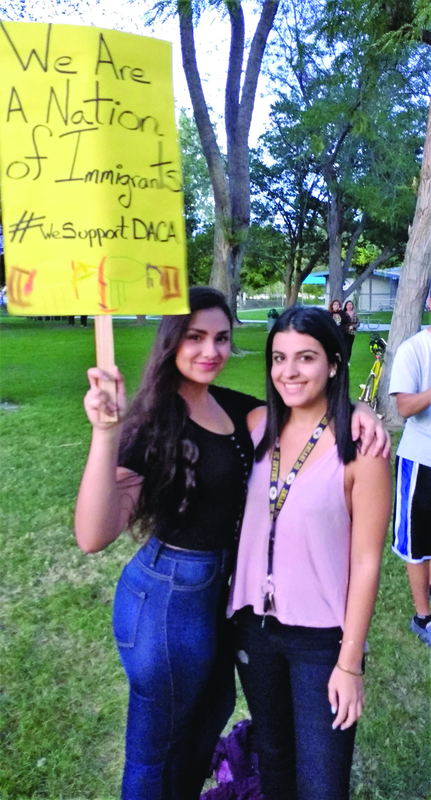 Alondra Ojeda and Neda Jiveh of Bishop join in a rally in support of DACA on Wednesday, September 13 in Bishop. Margarita Cuellar, a recently-retired English Learner Specialist at Mammoth Unified School District for 28 years, knew first-hand how scared her former students were when president Donald Trump announced last week that he would be phasing out the Deferred Action for Childhood Arrivals (DACA) program. Cuellar, who gained U.S. citizenship through marriage, ended up guiding many of Mammoth’s students through the process of obtaining their DACA status. DACA was established by the Obama administration in 2012, when Cuellar was working at Mammoth Elementary School. The policy allows individuals who entered the country as minors illegally to become eligible for a U.S. social security number, driver’s license, and work permit. Approximately 800,000 young people residing in the U.S. have DACA status, including 222,795 in California. The requirements for the status are stringent—individuals must have arrived in the U.S. prior to turning 16, but must be younger than 31. A criminal record would disqualify those seeking DACA status, and individuals also have to be in or have completed high school. They also must re-apply for their status every two years, paying a filing fee of approximately $500. According to U.S. Citizenship and Immigration Services, the majority of DACA recipients (260,800) are under the age of 19, and most (618,324) are from Mexico. Recipients also have to fill out extensive forms, which include the information of family members. “We gave them all of my information, including my parents’ information,” said Luis Velasco, now a senior getting his B.A. in business marketing at California State University, Chico, and a former Bishop High student. “We had to go to Fresno to get fingerprinted,” said Luis’ brother Mario, who is a Freshman at L.A. Valley College, studying kinesiology. He said that getting his driver’s license was “every teenager’s dream,” and that being able to work was a huge gift to his family. Mario said it’s been tough to worry about those opportunities disappearing. Though his DACA status had just been renewed for the next two years when he spoke to The Sheet, he’s only in his first year of college. “If I can’t continue my studies I don’t know what I will do…it was my parents’ dream for us to go to school and get better jobs. They brought us here for a better opportunity.